Chinese Astrology symbolizes the Dog and all those people born in this year as being of honest, loyal, dependable and friendly character. If the person is also a Western Astrology sign of Aries, then they usually acquire a generous share of the Dog's honesty and frankness. An Aries Dog personality is believed to be immensely truthful and open, but not at all blunt. They will tell you the truth about things, and it will be in the nicest possible way. The Aries Dog hates to hurt the feelings of others, yet finds it very hard to lie, so he or she tends to be tactfully forthright instead. The Aries Dog is a rather warm-hearted person who has a kind, caring nature, but one who is not easily fooled. These personalities may appear soft and easy to manipulate, but actually they are amazingly alert and perceptive. Many Aries Dogs have an uncanny way of seeing through people who try to take advantage of their kindness and patience. They also seem to have an instinct for doing the right thing. These individuals sometimes have what is known as a �sixth sense� that notifies them of people with bad intentions. They will normally be fairly skilled judges of character and avoid others who may not be as frank as them. 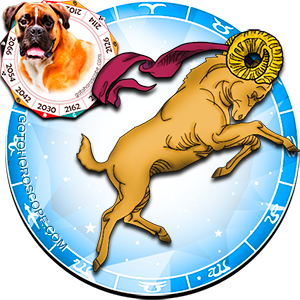 An Aries Dog picks his close friends carefully, as he likes to be encircled by those he trusts and can rely on. These people prefer to have a few very good friends rather than lots of casual acquaintances. They can be a little shy and sometimes cautious, and on edge when socializing, as they are often not as self-assured as other Aries personalities. An Aries Dog can be especially bashful when it comes to finding a soulmate. They will generally wait until others approach them to get to know them better, rather than the other way around. Once teamed up they will be extremely devoted to their partners. Natural curiosity steers the Aries Dog personality towards spending his spare time exploring and learning new things. They love to visit interesting places, and expand their knowledge by studying or reading about subjects they are fascinated by. As gifts, the Aries Dog will appreciate anything that will educate and entertain them. They like to have something constructive to do, as they are not normally into sports or other physical activities as relaxation methods. These characters also have a love of music, and often find this the most relaxing distraction of all. Weaknesses in the Aries Dog persona tend to be focused on their intuitiveness - they can sometimes get things wrong. These people often rely heavily on their instincts to evaluate people, things and situations. Occasionally, they can miss out on good friendships, genuine bargains and rare opportunities. They cannot help their built-in defenses and on occasion may regret not trusting someone or something. As the Aries Dog is not prone to dwelling on the past, his weakness does not direct him away from his forthrightness and optimistic view on life for long. If any sign is dependent on upbring and environmental circumstances it's this sign. You become thia accurate of a description depends on their up bringing and influences. some people become so gaurded or treat others in a nasty way because that's how they were taught. Completely accurate and truely fits my boyfriend! Intresting!!! The Aries Dog with no morale compass is a pathological liar and self centered. They are master manipulators and excellent at taming down others with similar traits. They are the dogs of war who need an enemy to channel theor energies on to free up the inner goodness under their war clothes. These are all true for me.. I'm an Arian female born in the year of the Dog.. I find it really hard to lie as I hate being lied to.. I am tactful when speaking because I never want to hurt anybody.. I also am not into pursuing anybody I like.. I wait until somebody begins to like me and make the first move.. but then I am very cautious before really taking risk in anything, in career or in a relationship.. So far, this has described my traits well enough.. The Aries Dog I know is also a compulsive, pathological liar due to deep ridden insecurities from a past relationship in which he felt he was used. He lied before even meeting me in person to make himself seem more interesting to me, to eggagerate the truth, and for attention throughout our relationship. I was unfortunately his next girlfriend and he was insecure with me, as I am much more outgoing socially and more confident than he is. He also told me he didnt know what I saw in him and that he couldnt believe how lucky he was to be dating a girl like me. He took out his revenge for his ex on me after our breakup, ironically it was somewhat similar to what she had did to him when they broke up. He lied to me about becoming too busy for a relationship. He's obviously got issues being close and trusting someone and had emotional storms that were hidden inside of him, he became depressed after his previous relationship before meeting me. He told me I was the best girlfriend he ever had and that I made him extremely happy, despite being too insecure to be with me in the end. This is some who wants to serve and doesn't have a compass. They are so busy acting, they can't find their center. Even month of the Dragon, Aries is special forces. They go in and blow things up so that something new will make camp. He will regret his blindness, but it's empty comfort when one comes equipped to love the child, but the child is already damaged. I'm a Sag Dog, married to an Aries dog. Hes a fire dog and I'm metal, but a strong metal. When I asked him not to speak to me in a certain way, his response was, "oh, you really attacked me, good one" and I said, like a good Sag, "I never attacked you, I gave you information". Total silence. He made one more attempt at trying to tell me that I was attacking him for being who he his and started walking toward me like we were going to fight and I smiled and shook my head at him. Even though he can fry me and exhaust me, I'm mutable. I rectify . I don't die. I'm the end of the season. Our strength is in our flexibility. The fixed signs have power of creation and must stop being fickle about the kind of service that comes their way and continue to offer direction and stop judging the quality of the fabric, the cardinal signs need to integrate reflection into their movement as part of their dance. The cardinals are like comets and without discernment take on whatever is in their gravity. The fixed and mutable can discern, but Cardinals require something different. Fixed and mutable signs can clash, but we can both cross our arms at a cardinal. That doesn't work for them. They are too busy moving to even know what they have done or what happened to them. Often they keep moving so they don't have to know. I'm sorry you had such a challenging experience, but programmed finite social order doesn't function the way the signs function. As a matter of fact, our individual expressions of our signs suffer as a result of the artificially imposed social order. We have more natural fidelity without it. I'm an Aries Dog, describes me to the T.
All true about me except I do tend to dwell on the past often. Lu, do you know whether (and if so, to what degree) you have retrograde planet(s)? The Aries dog I know is a compulsive liar, very sneaky and manipulative. Has cheated on his wife at least 5 times, and is incredibly manipulative. He has no shame, is an exhibitionist. Charming when you meet him, delightfully childlike, until you see his dark side. The optimism is accurate, but to the point of blindness to others' hurt. I've just encountered exactly the same type of person, born in the dog-aries sign; definitely a sociopath, very frightening in his lies... luckily I didn't let the relationship go further,.. very controlling, manipulative as you say, excellent at lying and looking at you steadfastly while doing so, over and over. Long-term schemer with big ideas and long-term plans for their 'target' which could have been me. Very scary! Then he is a psychopath. Your observation sounds to be accurate about Aries men, in general. Aries women/dog are completely the opposite! Just wanted to clarify the distinction. This site's description of women is right on! So meaning it is true that aries dog is really have a warm heart person, has 6 sense and they like to have something constructive to do as they are not normally into sports or other physical activities as relaxation methods. These characters also have a love of music and often find this the most relaxing distraction of all. Well All True indeed for me. Most accurate for Aries year of the Dog.